In this gallery is the technically challenging to capture but timeless to observe subject of falling water. 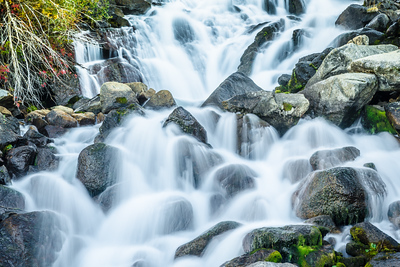 Some may have heard of 'negative ions' - which are odorless, tasteless, and invisible molecules that we inhale in abundance in certain environments particularly near moving water. Once negative ions reach our bloodstream, they are believed to produce biochemical reactions that increase levels of the mood chemical serotonin, helping to alleviate depression, relieve stress, and boost our daytime energy. 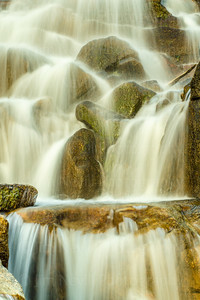 In this gallery are various different takes on the beautiful and healing energy of falling water. 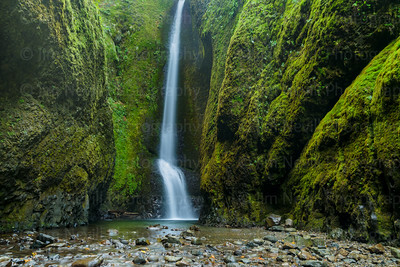 Oneonta Falls, Columbia River Gorge, Portland Oregon, at low flow offers tranquil beauty. 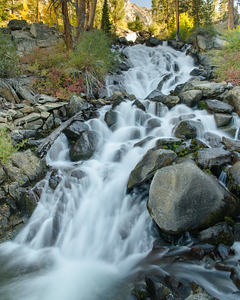 In the backcountry of Yosemite National Park you can find all kinds of pristine beauty. 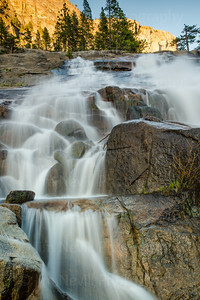 This is the White Cascade located at Glen Aulin High Sierra Camp, on the Pacific Crest Trail. 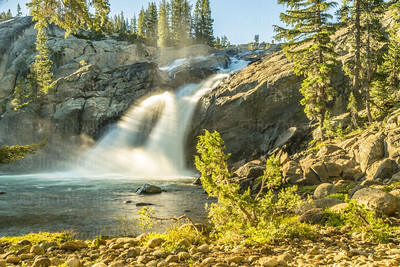 Just upstream is the incredible Tuolumne Meadows - which feeds the Tuolumne River and this explosive waterfall seen here illuminated by the warm dawn light. Printed in Limited Editions of 100 by size. This was one of my favorite moments on a recent backpacking trip into the Grand Canyon of the Tuolumne in Yosemite National Park. This small cascade had such a unique and soft shape to it that I couldn't leave. I worked around it from all angles and experimented with many different shots. Since the river is deep in the canyon there is no hope of getting direct sunset light on the water but the orange glow of the setting sun did hit squarely on the rock faces above which intern reflected down onto the river below. All this color lasted for 5 minutes or so, and poured over the scene - even making the trees glow. It was really beautiful to witness. Sierra Nevada, CA. There are many elements to a photograph which make it work or not. Ansel Adams' famous quote was, "photography is knowing where to stand." He's right of course but once you do all the work involved in being at the right spot the challenge becomes timing and for me, storytelling and originality of composition. Any musician will tell you that it's not so much the chords you play but the arrangement and rythmic subtleties that makes your sound unique. All this stuff runs through my head when I make a picture and to me, the result here is a nice balance of movement, tranquility, groundedness, purification and change. Hana, Maui - Haleakalā National Park. 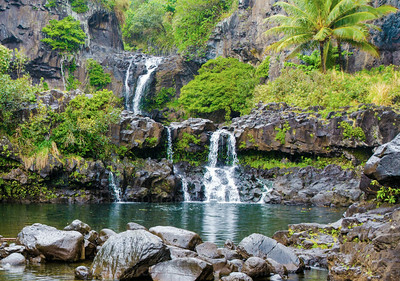 O’heo Gulch Pools are located near the end of the Road to Hana and along the Pipiwai Trail. 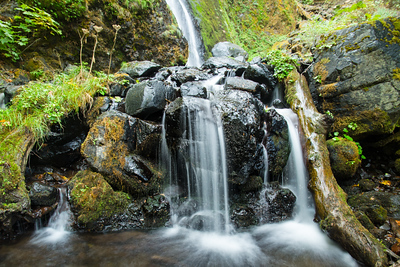 The trail leads you on a 4 mile roundtrip hike, where you can witness several waterfalls, including the 400 feet Waimoku Falls. The Pipiwai Trail above the Seven Sacred Pools is one of the best hikes on Maui. I tried to shoot a long exposure of the waterfall to smooth the water but the winds were so strong I had to settle for the photo realistic version. I like it. I had to look it up to make sure, but the word ethereal just comes to mind when I look at this photo. Here's the definition, you tell me if it's too much of a stretch, "extremely delicate and light in a way that seems too perfect for this world." A timeless capture of one of the most incredible waterfall regions in the world - the Grand Canyon of the Tuolumne of Yosemite National Park. A friend and I backpacked into the canyon in June 2014 and this well hidden, barely accessible waterfall is rarely seen from this vantage point. 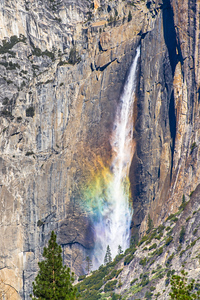 Seen here is the cascade reflective of the bright orange sunset afterglow, rainbow included. ELEMENTS SERIES - 'Where to turn he lens', a constant question and challenge for me. 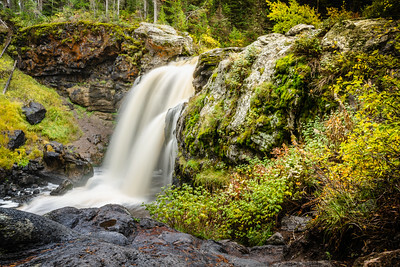 Out in the wilderness where I shoot most of my waterfall photos it is difficult to narrow down my focus when surrounded by scenery where everything amazing. In the case of this photo it was what happens to the falling water once it lands. Lower California Falls, Yosemite National Park. 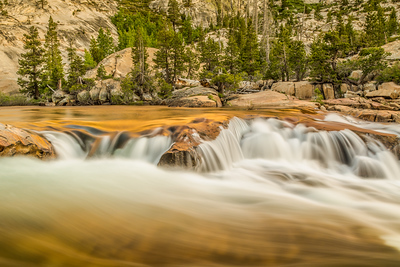 There are countless features to focus on in a place as diverse as Yosemite but water is often overshadowed by rock. With monoliths like El Cap, Half Dome and the Cathedral it's no wonder, but on this particular photography trip a friend and I shifted our focus to aquatic scenery. What I experienced by doing it was something I never expected, color - lots of color. 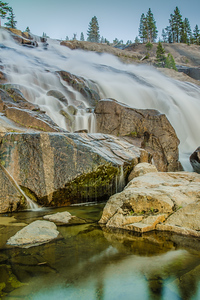 This photo is a closeup of the lower section of California falls on the Tuolumne River. I shot it by rock hopping my way into the center of the river and setting up on a bolder downstream, to give the feeling of not just being near the river, but in it. 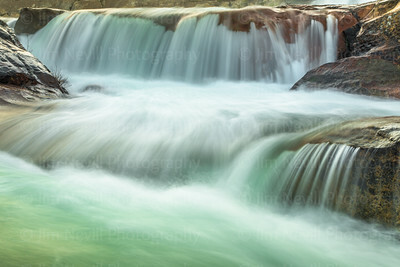 In addition to the turquoise and green in the water itself there is a bouquet of red, orange, yellow and other earth tones reflecting up from the river bed below. I couldn't see it with my naked eye but the long exposure needed to blur the falling water did register the color and resulted in this colorful shot. My good friend Josh Miller is a phenom Landscape photographer. He's graced the covers of many a photo magazine and recently earned a place on the 2015 National Geographic calendar. He and I spent a few days shooting Yosemite together in March 2014 and this is one of his perspectives that he shared with me. He knows when and where stuff like this is happening. This shot looks fake, but it's real although it is the result of tricky photography. In the late morning the sun rose from the top left of the frame, California Falls in Yosemite NP was raging and over-illuminated. 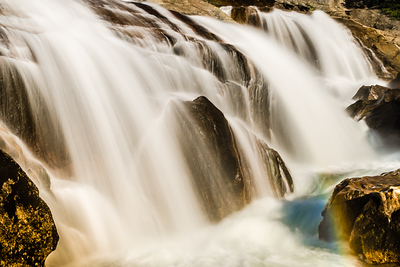 Any photographer will tell you to shoot waterfalls in the shade because the glare is too great, especially when using the long exposure required to soften the rushing water. To make this happen I used multiple tinted filters, the equivalent of 4 or 5 pairs of sunglasses to darken the light and allow the correct exposure - resulting in this 3D looking waterfall. Moose Falls, Yellowstone National Park. I shot this picture during a short break in a raging hail storm which took place on September 30, 2013. It was my first time driving through Yellowstone National Park and despite the bad weather I had only this one day to do it. In 2013 the government shutdowns were pending and the next day, October 1 would begin the closures of all 'non-national security' offices. None of us really thought it would happen but just in case I went and managed to snag this shot. They next day, every national park did in fact close, and I was among the last few stragglers in Yellowstone just before the gates were shut. Shot at Eagle Falls on the western shore of Lake Tahoe on the evening of 11/17/14. 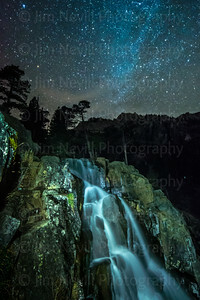 I have been dreaming of shooting waterfalls under starlight for a while now but for some reason it seems that I end up going to waterfall locations only cloudy nights or during full moons which over-illuminate the dark skies. This time I was onsite when the conditions were perfect for star shots, a sub 20 degree night with clear skies and light winds. I descended 100' or so down a steep boulder field in the pitch blackness hoping that I could find a vantage point to set up to shoot from. Until this night I had never done this climb nor heard of anyone else doing it so finding the route down was tricky. Luckily there were some tree roots dangling over the edge so I was able to down climb those as well. When I arrived at the scene I cheered out loud (alone in the woods) and found a location to set up my tripod. The tripod barely fit on the rock outcropping from which I shot the image and I was therefore forced to stand on a neighboring boulder and take the photo with a shutter release cable. 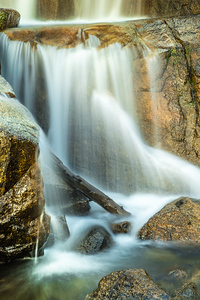 Taken at a spot in the Grand Canyon of the Tuolumne, Yosemite National Park - in a lesser known area that is mostly inaccessible. My friend and I spent four days in the backcountry searching out remote locations to shoot Yosemite's 'other' falls. We found this spot and couldn't get enough. The Columbia River Gorge is about 40 minutes outside of Portland, Oregon. A vast and lush region, mostly accessible by just a short walk and the nature is pure spectacular rainforest, even by Hawaiian standards. 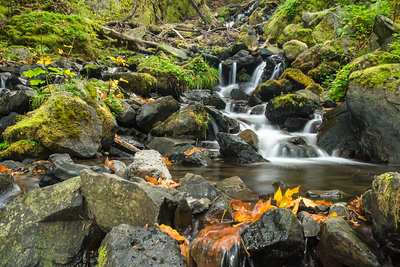 Oneonta Grorge ends at Oneonta Falls, and during my visit in early autumn 2015 the falls and creek were slowed to just a trickle but it made for a nice opportunity to capture the rocks and lower canyon walls at their most exposed. 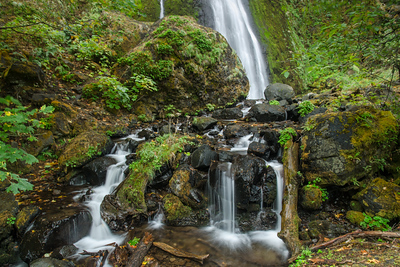 near Portland, OR in the ‪#‎ColumbiaRiverGorge‬ lies one of the most waterfall rich regions of the country. I hiked up and down dozens of creeks looking for what I thought would be fresh compositions when I stumbled on this jet black, volcanic rock scape after a recent downpour. Above the cascade, about 30 yards in the distance is the waterfall that feeds this creek, creating an optical illusion of sorts. 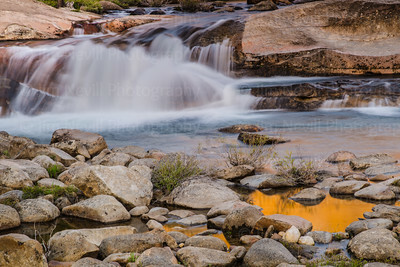 Taken in Yosemite National Park during sunset, this image shows the low water result of the CA drought - but leaves a beautiful result in the reflective pools normally covered by the flowing Tuolumne River. ELEMENTS SERIES - 'Where to turn the lens', a constant question and challenge for me. 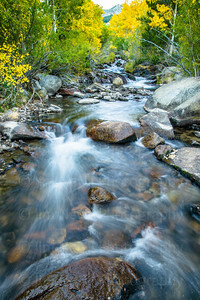 Out in the wilderness where I shoot most of my waterfall photos it is difficult to narrow down my focus when surrounded by scenery where everything amazing. 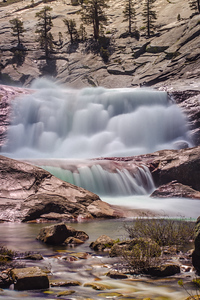 In the case of this photo it was the story told by the criss-cross boulder field and how the water reacts to its shape. Taken in the Eastern Sierra, I enjoy spending at least a few days a year near here searching out new locations to shoot. The beauty of waterfalls is that they are always changing and the same location could be entirely different from year to year. Just after sunset is generally a safe time to try and capture waterfalls because the direct light is far removed and it allows you to properly expose the water without making the other elements in the shot too dark. This was a 2.5 second exposure. In May 2015 I landed on the cover of Shutterbug Magazine. My friend and fellow photographer, Josh Miller and I were on a wilderness trip in Yosemite National Park. Josh’s work frequents magazines like Outdoor Photographer and Backpacker. A few times every year we reconnect and backpack to remote locations to photograph. 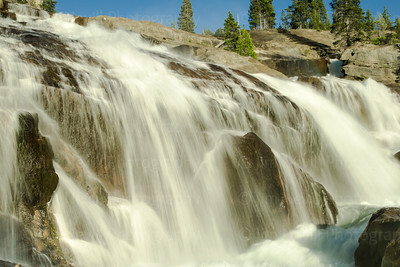 The focus of this mission was explore the lesser seen regions of Yosemite National Park’s High Country. In Josh's cover shot I am seen standing on a rock outcropping at Waterwheel Falls, deep in the Grand Canyon of the Tuolumne. This is the photo I was making while Josh was shooting his cover shot. Columbia River Gorge, Portland, OR. Autumn in the Columbia River George, Starvation Creek region shows the results of thousands of years of storms, debris and organic material collecting in this watershed. Aspen lined creek in autumn, Bishop, Ca.